The Gin Blossoms and Collective Soul play Bluesville at Horseshoe Casino Tunica on Saturday, August 30th. 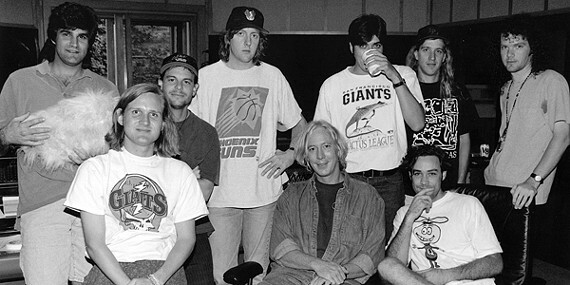 Memphis producer-engineer John Hampton worked with the Gin Blossoms on a string of hits in the 1990s. In 1989, I was working on a band named Tora Tora with Brian Huttenhower from A&M records. Their second LP, Wild America, never quite got off the ground like we had hoped. The truth of the matter was that Tora was perceived as a "hair band." And, with the flaming intro of Nirvana, a new music scene was emerging. Soon after 1991, a new slice of what I call "Pop-Rock" entered the mix in the form of the band Gin Blossoms. These guys were not heavy like Nirvana or Soundgarden. Their rather melancholy songs and well-crafted melodies, written by Doug Hopkins, Jesse Valenzuela, and Robin Wilson, along with classic pop music production, became music to which any teen ever damaged by love could relate. Huttenhower hired Arthur Payson (Ratt, Desmond Child) to finish Tora's last two songs and sent me to Tempe, Arizona, to begin on a record with Gin Blossoms. 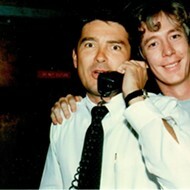 Their semi-pro self-release (a common phrase today) "Dusted" from the late '80s had caught Huttenhower's ear. My first trip to Phoenix was around the spring of '91. The second we met, it became obvious that we would get along: They loved drinking beer and playing music around Tempe. After a few days, we started working on a record based on "Dusted," and we began production on New Miserable Experience, a title I thought was fitting given their "Go For It and Fail" attitude. We cut the record with the band playing live, a few overdubs of harmony vocals, fixing individual instrument clams, and just a pinch of beefing up their slightly timid sound. I was able to create a modern sound, some call "jangle rock": having a clean element fused with a rowdy element. Meaning if I had two clean guitar sounds, I would screw one up with distortion. Jesse was the jangle, and Doug was ... harsh. These two elements of fire and ice can be heard on many hit records, my favorite example of which being the acerbic edge of John Lennon fused with the cloying anti-edge of Paul McCartney. So we finished New Miserable UNDER the already-too-low budget for those days: I think we only had about $65,000. Considering Tora Tora's budgets, this was a drop in a bucket. Upon its release, the Blossoms spent 15 months on the road. When they were in a region of the U.S., they became immensely popular in that region, but it would wane when they got to the next region. And the same thing would happen again. They would be hot in the southwest, then in the northwest, as the southwest cooled. This happened in every region of the country, but never all at once. So, as A&M contemplated pulling the plug on New Miserable, they decided to go one more mile. It was a pretty risky mile: They pulled the band off the road, repackaged the record with new artwork, made a new video for "Hey Jealousy," and, with one giant promotional push, reintroduced the Gin Blossoms to the country 15 months later — almost as if they had never been released! This time it worked. Out of the box, the record sold 500,000 copies, and we all started seeing a bit of financial reward. Since it seemed to be at its peak of sales from the first single about one week before Christmas, we all enjoyed massive sales through the holiday season. And that was just from the first single. I thought we had five singles, so as each high-sales period waned, the record company would release another single, and another, and another. And it kept the record in the top 50 albums for nearly a year. After that, the Gin Blossoms were becoming a household name. Their singles, "Hey Jealousy," "Found Out About You," "Mrs. Rita," "Allison Road," and "Until I Fall Away" were the five singles that kept them on top. With this new popularity, and as we prepared to try it again for a second record, the band was approached to do a song for the soundtrack of a movie entitled Empire Records. This resulted in "Til I Hear It From You" written by Jesse with Master of Melody, Marshall Crenshaw. That gave the world a late, sixth single. "Til I Hear It from You" not only sold the Empire soundtrack record, but it reinvigorated sales of New Miserable. Now we're talkin'. There was money EVERYWHERE!! And we were so fired up about the second record's sales with the inclusion of "Til I Hear It," we thought it was going to be huge. But it seems true that for every action there is an equal and opposite reaction. First, my good friend and the band's guitar player and key songwriter writer, Doug, killed himself right before Christmas of '93, which weighed heavily on us all. Doug really was the miserable guy. Alcohol and depression had just overwhelmed him, not to mention the fact that the band had been forced to fire him. The label's concern about having a dysfunctional band member on tour had ultimately led to their finding a replacement for Doug. Next was the news that we could not have "Til I Hear It From You" for record two because the label that released the Empire Records soundtrack was justifiably concerned that the A&M sales might dwarf their soundtrack record sales. And finally, I was introduced to a profound concept relating to songwriting: A songwriter puts together songs from his or her entire life — some may be 10 years old, written at a time when there was zero pressure to write songs. Now, we were expected to equal or beat the songs from the first album. But if one takes an artist and puts him on the road for a 15-month tour, and shortly thereafter for another, larger 15-month tour, and you add the fact that all of the money coming in kind of relaxes the old anxiety of youth, you now have a MAJOR song problem. So, the band starts down the path of record two with some good songs, but not quite the songs of youth. Though the second record has gone on to sell somewhere between 2 million to 3 million copies and is still selling today. After the second record, the final blow came that ended this chapter hit. Robin announced that, because his original place in the band was as a mouthpiece for Doug's songs, he felt his work with the Gin Blossoms had served its purpose and that it was time for him to move on. (I could have strangled him right through the phone wires.) And that was that.